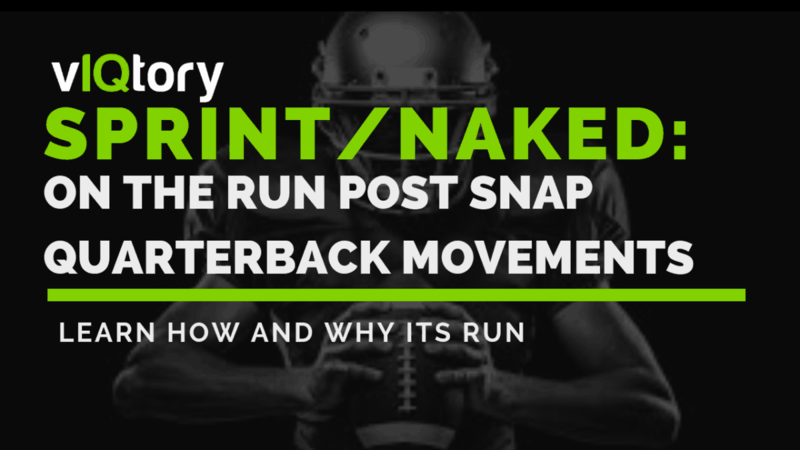 The term sprint out and naked are commonly used in Pop Warner and professional football. What do these terms mean? Sprint out and naked are two offensive concepts in football. Both concepts get the quarterback on the move and allow him to throw or run the football. Offenses often leave the defensive end unblocked, hoping the quarterback can outrun them. First I will talk about the basics of sprint out. Sprint out is meant to be a play that allows the quarterback to get the ball out quickly . The offensive line slides to the side that the quarterback is sprinting out to. They know that the quarterback is expected to get the ball out quickly , which often allows them to leave the backside defensive end unblocked. Sprinting out of the pocket means the quarterback is going to be throwing “on the run”; he will not stop to set up his feet before he throws. If the QB sees green grass ahead of him he can take off and run the ball, as he is already sprinting outside the pocket. This is what allows the sprint out action to be so effective for athletic quarterbacks. Naked play action is often a long developing play coupled with some sort of run action. The QB must sell the run fake hard to the running back. The offensive line is responsible for selling the run, then they must sit in their gap. After the QB sells a good play fake , he must escape the pocket and get his eyes downfield to find an open receiver. Similar to sprint out, if there’s green grass ahead , he can take off and run the football. In this clip, as soon as the QB gets the ball he gets his right foot directly pointed towards the sideline . He then gets to about 8 1/2 yards deep to clear himself from the line of scrimmage. Ideally, the quarterback should be at 7 yards to get the ball out on time, since the offensive line is reach blocking to the same side of the sprint out. The QB then needs to get his front shoulder pointed to his receiver, who’s in the flats heading towards the sideline. The QB delivers a great ball on the run , while finishing towards his target. With this clip, the QB is now sprinting towards the left side. As soon as he catches the snap , he gets his left foot pointed to the sideline . His depth on this drop is right at about 7 yards. He then attacks downhill , rotating his body so that his front shoulder is pointed towards the receiver. It is CRUCIAL for right handed QB’s that are sprinting to the left side to rotate their body and get their left shoulder pointed to the target. With this play in particular, the QB is performing a play action fake coupled with an inside zone fake to the left. The play fake is extremely important on this play. As soon as the quarterback catches the snap, he gets his eyes on the defensive end . The defensive end crashes down to the play fake, as most will do. This tells the quarterback that he has the edge to get to without having to avoid the defensive end . His aiming point for depth should be about 7 yards from the center. Similar to sprint out, if there is green grass ahead, the QB can take off and run the football . What happens when he defensive end stays with the QB? In this clip, The QB realizes that the D end is up-field , so he dips underneath him . He then re-gains depth to still be able to throw the football accurately on the run . Sprint out and naked are great compliments to an offense. However, you should understand that these concepts will not work if they are overused or not set up right. For example, if a team knows that your ability to run the ball is lacking , chances are they won’t fall for the naked play action fake. How do you implement sprint and naked play action? Let us know in the comments below! Q : WHAT IS SPRINT OUT? A: Sprint out is when the QB sprints out the pocket quickly as he can and throws the ball on the run. The offensive line is sliding towards the side where the quarterback is sprinting to. Q : WHAT IS NAKED PLAY ACTION? A: When the quarterback meshes with the running back on a play fake then pulls the ball out , escaping the pocket. The defensive end is unblocked and the quarterback is responsible for reading him to determine how he will escape the pocket after the play fake. Q: WHY DO TEAMS RUN NAKED BOOTLEGS? A: To get the defense to come up and play the run , so that routes after the play fake are more likely to be open. Q: WHY DO TEAMS RUN SPRINT OUT? A: To get the quarterback on the move right away and to get the offensive line on the move. It is a great way to let your quarterback be an athlete and to show a different blocking scheme up front . Q: DO YOU NEED TO HAVE A FAST QB TO RUN SPRINT OUT OR NAKED? A:No your QB does not have to be “fast”. However, your QB MUST have good footwork and be explosive with his first couple of steps.